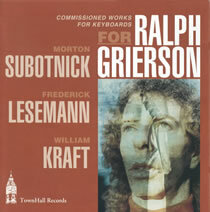 Keyboard artist Ralph Grierson takes on and masters the most formidable challenges of the avant garde music of the 1970's. Each composition was written for and in collaboration with the performer. Grierson displays his talent within a wide spectrum of acoustic and electronic sound, utilizing prepared piano, Rhodes electric piano, piano modified by an electronic ghost score, and synthesizers.